Have you ever wanted to view MSBuild log files in Markdown format? If you are using psbuild then you’ll now get this feature for free if you upgrade your install. 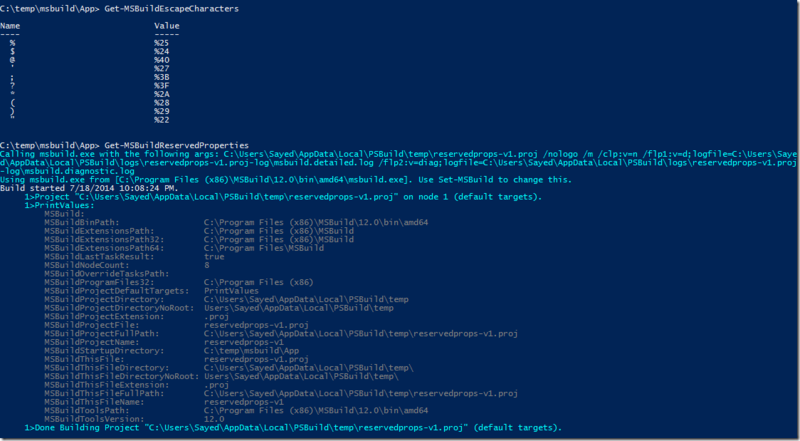 psbuild is a PowerShell wrapper for msbuild.exe. You can learn more about it on the github page or my previous blog post on it. Using psbuild to build a project the basic command will look like the following. Open-PSBuildLog will open the log file from the last build executed by that instance of psbuild. The Open-PSBuildLog has a single parameter, format, which defines which log file to return. This parameter takes the following values. Detailed is the default format. So to get your log file in MSBuild format execute. This will open the .md file in the default editor. Below is a screenshot of a sample log file. If you have any comments reach out to me on twitter or open an issue in psbuild to discuss further. For the past few months I’ve been working on a project I’m calling PSBuild. It’s an open source project on GitHub which makes the experience of calling MSBuild from PowerShell better. Getting started with PSBuild is really easy. You can install it in one line. You can find this info on the project home page as well. When you install PSBuild one of the functions that you get is Invoke-MSBuild. When you call Invoke-MSBuild it will end up calling msbuild.exe. Some advantages of using Invoke-MSBuild are. A most basic usage of Invoke-MSBuild. This will build the project using the default targets. The call to msbuild.exe on my computer is below. To get a sense for how you can use Invoke-MSBuild take a look at the examples below. When you call Invoke-MSBuild on a project or solution the output will look something like the following. Notice that line at the end. You can access your last log using the command. This will open the detailed log of the previous build in the program that’s associated with the .log extension. You can also use the Get-PSBuildLastLogs function to view the path for both log files written. If you want to view the folder where the log files are written to you can execute start (Get-PSBuildLogDirectory). There are a couple of things that I’m constantly having to look up when I’m authoring MSBuild files; Reserved property names and escape characters. PSBuild has a helper function for each of these Get-MSBuildEscapeCharacters and Get-MSBuildReservedProperties. In the screenshot below you’ll see the result of executing each of these. The Invoke-MSBuild cmdlet has a property –defaultProperties. You can pass in a hashtable just like the –properties parameter. These properties are applied as environment variables before the call to msbuild.exe and then reverted afterwards. The effect here is that you can have a property value which will be used if no other value for that property is specified in MSBuild. There is so much more to PSBuild. This is just the tip of the iceberg. Keep an eye on the project page for more info. I’d love your help on this project. Please consider contributing to the project https://github.com/ligershark/psbuild.